Why do you think I had a thread about power steering! A smaller wheel would be nice, but not until I get rid of the armstrong steering! I have not ever layed fiberglass, so wood was my best option. OK, here are some pix of my -01 Eagle cockpit. 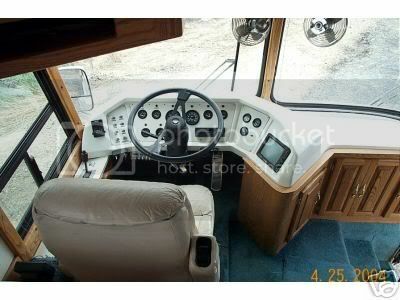 Note that there is only a center console, which is not as wide as the steering wheel. All the instruments which you are regularly interested in are up there in easy view. To either side you can see the foot pads, and when you are reared back with your feet up on the pads, cruise on, it is VERY comfortable. The side consoles, plus the overhead panels include the rest of the stuff which you need, but don't need to 'watch'. The video displays are the back-up camera monitors, plus the computer monitor for GPS (MS Streets and Trips). The other upper panel is my HVAC control. It got to be sort of 'out of hand', and it even ended up with a small computer (PLC). Go to: My public Google Picasa web site (Picasa is free, works great). You can click 'Robert's Gallery' for some other pix. What is the knob to the right of the foot feed? Is that your cruise? Very interesting layout. How long did it take you to figure out where you wanted stuff? With my puny setup it took a lot longer than I anticipated, but that's normal for me! Your shifter looks like a stick from an aircraft of some sort. I remember how you said you shift it, was it tough to learn? Thanks for taking the time to let us see your handy work! The knob to the right of the foot pedal is a 'throttle kicker'. The cruise disconect button (black one on the right side) on the stick also kicks a little air cylinder which pushes the pedal down. It is adjustable, so I can pre-set the RPM and correlate it with bus speed for down shifts. Works exactly like the full throttle downshift, except that you can choose your own RPM, and accordingly, speed. The M-11 electronic engine RPM with the 'kicker' is quite consistant, but varies a bit with altitude. Yours looks very nice! Maybe someday I'll be able to do the same, but for now I'm real happy with just having one!